Jugaad is also a colloquial Hindi word that can mean an innovative fix or a simple work-around, sometimes pejoratively used for solutions that bend rules, or a resource that can be used as such, or a person who can solve a complicated issue. It is used as much to describe enterprising street mechanics as for political fixers. This meaning is often used to signify creativity to make existing things work or to create new things with meagre resources. 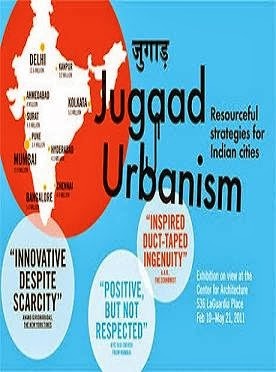 The jugaad concept can be contrasted with the Western (originally American) concept of a hack or kludge. Although in its general meaning "hack" is very similar to "jugaad", a jugaad can be thought of more as a survival tactic, whereas a hack, especially nowadays, is seen an intellectual art form. Both concepts express a need to do what needs to be done, without regard to what is conventionally supposed to be possible. Jugaad is increasingly being accepted as a management technique and is recognized all over the world as an acceptable form of frugal engineering pioneered in India.Companies in India are adopting Jugaad as a practise to reduce research & development costs. Jugaad also applies to any kind of creative and out of the box thinking which maximizes resources for a company and its stakeholders.